Jak Heath.com: Got my Cake and Ate it. This is my Birthday cake that the gang at work bought me, it was really funny as they thought my Birthday was Mothering Sunday so thought I'd be off work. Actually it's Monday so that means we will just have to have another cake for Monday now now isn't that a shame. This is the not so flattering photo of me trying to blow out the candles on my cake, that may sound an easy task but..... they were the type that everytime you blew it out it re-lit grrrrrrr. The young lad in the background is Nigel, he is one of our newest employee's at work and he just happens to be the nicest young man you could wish to meet. 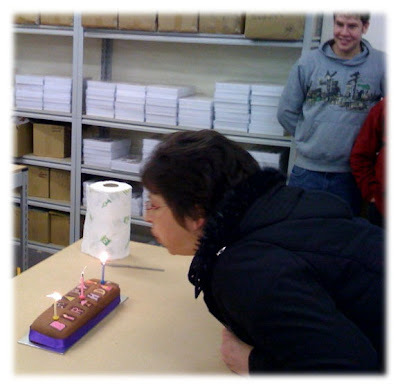 Happy birthday for Monday Jak - my last cake had a 3 million candle power lamp on it! !Glad to hear you are starting to feel a bit better. Yummy looking cake, are you posting any out! Have a great day on Monday. I think you look fabulous Jak. How nice that your friends at work wanted to celebrate your birthday. I think I can speak for all of your fans in blog land and say that we sure do appreciate your beautiful, inspiring work and your lovely personality! 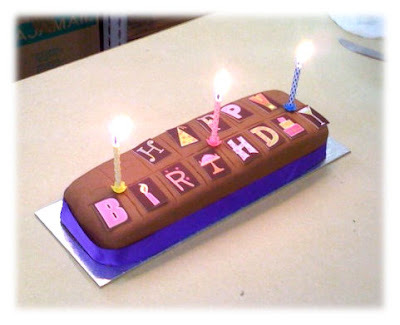 Well that is brilliant another Birthday cake :0) Nice when a mix up turns out well isnt it. Happy Birthday for monday Jak. your cake looks great. & another cake on monday.Good job you arent on a diet. You deserve a great one. you are such a lovely person. Happy birthday for Monday, Jak! Hope you are feeling better. Hope you are feeling much better. HAPPY BIRTHDAY FOR MONDAY and thank you for all your generosity. He he I guess it will be hard having a second cake! !